It seems that in the seventeenth century the Jesuits are on the point of trying to negotiate the academic and scientific changes in the world outside of the Catholic Church and Church tradition. The Ratio Studiorum,which was a document to order Jesuit teaching or a Studienordnung, it was not a pedagogical text rather it was a set of rules to best utilize the time alloted for learning. In the First version of the Ratio, left no time for mathematics or any sciences outside of Aristotelian natural history. 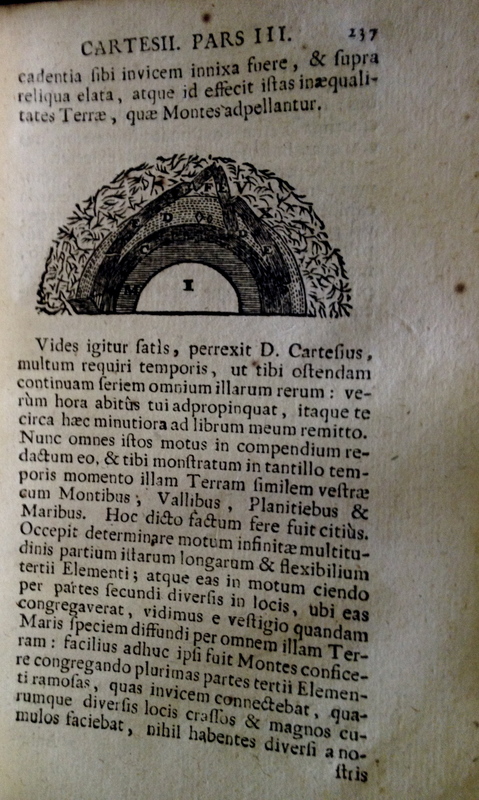 A revision was made perhaps under the influence of Christopher Clavius, S.J. 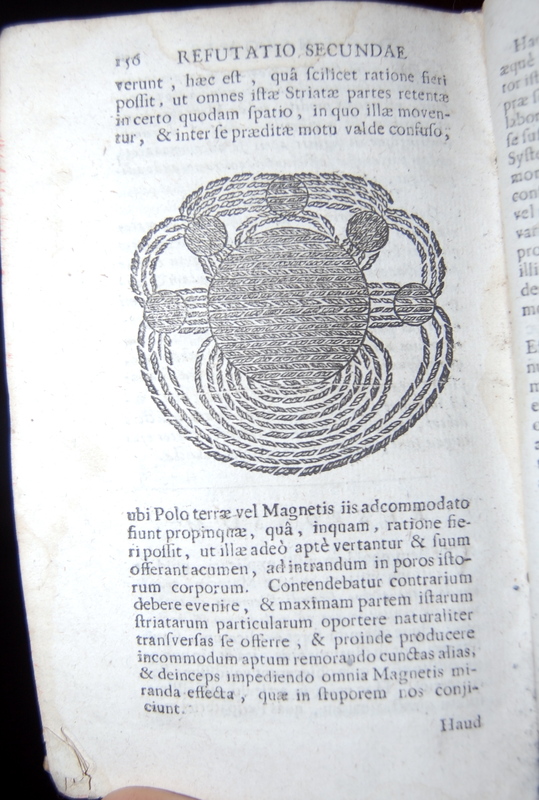 (1538-1612), to include astronomy and Mathematics. Armed with updated tools Jesuits proceeded to come to terms with recent developments in cosmographical views initiated by the discoveries in astronomy of Tyco Brahe and Galileo and the philosophy of Descartes. Gabriel Daniel, in a sarcastic way takes on both. Novae Difficultates A Peripatetico Propositae Auctori Itineris Per Mundum Cartesii. Large duodecimo First Latin edition. The first edition, in French, was printed in 1693. *4,A-F12,G8 There are 18 text woodcuts depicting various aspects of the Cartesian system as contrasted to the earlier peripatetic school such as: “S. 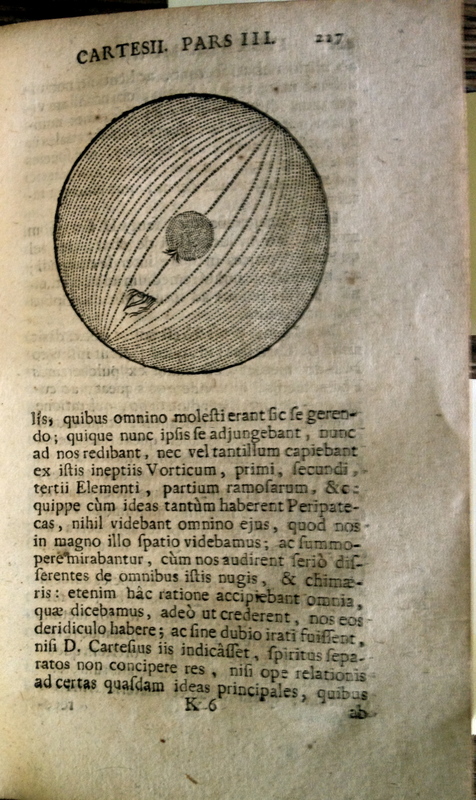 Vortex Solis,” and two engravings of the Copernican cosmology among others. This copy is bound in contemporary full vellum. The leaves are in very good condition and the engravings crisply executed. Gabriel Daniel, French author and Jesuit, was born at Rouen in 1649. He wrote a “Reply to Pascal’s Provincial Letters,” which was admired by the Jesuits. 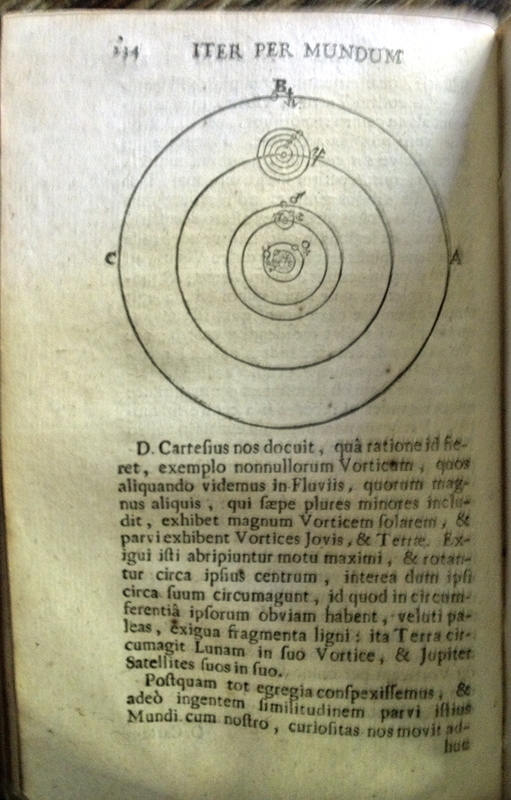 In Iter Per Mundum Cartesii, Daniel describes his imaginary travel to find Descartes on the moon and in the upper spheres. The work is one of the most important anti-Cartesian polemics of the 1690’s and it attacks the whole of Descartes system. 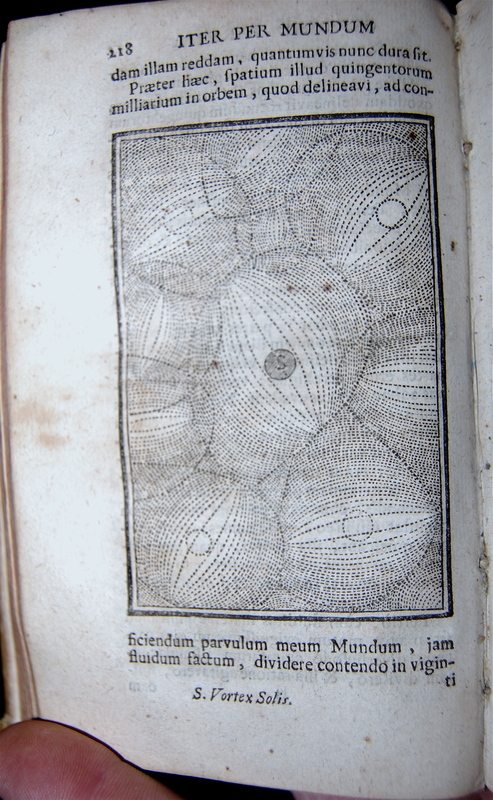 It is much like the earlier Iter exstaticom coeleste (1660) by fellow Jesuit Kircher. Daniel’s imaginary journey ” aims principally at the sharp Cartesian distinction between body and soul, related in a satirical fashion the voyage of the disembodied souls of the narrator, of Mersanne, and of another old friend of Descartes in the upper spheres. On their way to visit Descartes in the third heaven, they meet the souls of Aristotle and the disciples of descartes (clearly refelcting here the philosophical opinions of Gabriel Daniel himself). 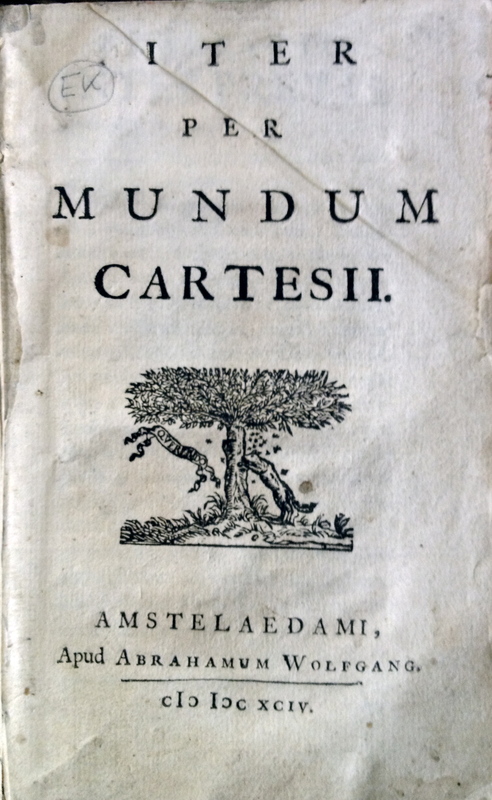 One of the articles of that treaty stipulates that the Cartesians will refer to Aristotle with more respect, whereas the Aristotelians will refrain from calling Descartes “Enthusiast”, “Madman”, “Heretick” or “Atheist” – all of these evidently labels commonly used by the opponents of Descartes at that time.” (Michael Heyd in “Be Sober and Reasonable”) The Iter Per Mundum Cartesii is a translation of Voyage du monde de Descartes, 1691.